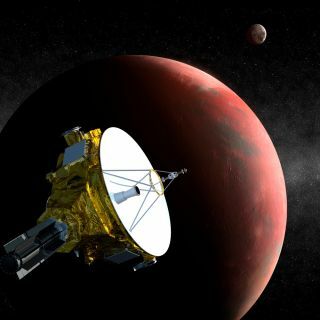 Artist's concept of NASA's New Horizons probe flying past the dwarf planet Pluto on July 14, 2015. New Horizons crossed the orbit of Neptune on Aug. 25, 2014, 25 years to the day after NASA's Voyager 2 spacecraft flew by the distant blue planet. A speedy NASA probe has crossed the orbit of Neptune, notching one more spaceflight milestone on its way toward a historic flyby of Pluto next summer. New Horizons — which is scheduled to zoom through the Pluto system on July 14, 2015 — passed Neptune's orbit today (Aug. 25), 25 years to the day after NASA's Voyager 2 probe executed the first-ever flyby of faraway Neptune and its icy moon Triton. This labeled photo identifies the planet Neptune and its large moon Triton as they appeared to NASA's New Horizons spacecraft on July 10, 2014 from a distance of 2.45 billion miles (3.96 billion km). New Horizons is headed for a 2015 flyby of the dwarf planet Pluto. On Aug. 25, 2014, the probe passed the orbit of Neptune. "We stand on the shoulders of giants — giants like [Voyager project scientist] Ed Stone and his Voyager science team that pioneered how to do the exploration of the deep outer solar system," New Horizons principal investigator Alan Stern said during a news conference today, adding that the New Horizons team views the Voyager scientists and engineers as mentors. As it neared the Neptune orbit crossing last month, the piano-size New Horizons probe even took a photo of the big blue planet and Triton, which were nearly 2.5 billion miles (4 billion kilometers) away at the time. "They're so far away they're only points of light," Stern said of the photo, which was taken July 10 but publicly released today. "We don't see the kinds of detail to make the discoveries that Voyager could. That's the power of going close." "We were surprised to find such an active atmosphere so far from the sun," Stone said today. Stern expects many surprises when New Horizons reaches Pluto, partly because so little is known about the dwarf planet. It's so dim and far away that the best photos by NASA's powerful Hubble Space Telescope show Pluto as a blur of pixels. "Everything that we know about the Pluto system today could probably fit on one piece of paper," Stern said. New Horizons will use its seven science instruments to lift the veil on Pluto. The spacecraft will map the dwarf planet and its five known moons, determine the composition of Pluto's surface and atmosphere, search for undiscovered moons and a ring system and do many other things, Stern said. "It's going to be a bonanza for science in so many ways," he said. "This is just mouth-watering." Indeed, New Horizons' Pluto encounter will mark the first up-close reconnaissance of a previously unstudied world since Voyager 2 flew by Neptune a quarter-century ago, Stern added. On it's way to Pluto, NASA's New Horizons spacecraft captured a view of Neptune and its large moon Triton on July 10, 2014, from roughly 2.45 billion miles (3.96 billion kilometers) away. In the past two decades or so, scientists have come to realize that Pluto is just one of many dwarf planets that orbit the sun in the Kuiper Belt, a repository of icy bodies beyond Neptune's orbit. So learning about Pluto could also shed light on the other denizens of this dim and distant realm, Stern said. New Horizons rocketed away from Earth at 36,000 mph (58,000 km/h) shortly after its January 2006 liftoff, making it the fastest spacecraft ever launched. The probe is now about 2.75 billion miles (4.43 billion km) from Earth and just 273 million miles (440 million km) from Pluto, NASA officials said. Mission team members hope to send New Horizons on to visit another Kuiper Belt object after the Pluto flyby; they have been looking for other possible targets using Hubble. Voyager 2 launched in August 1977, a few weeks before its twin, Voyager 1. Together, the two probes pulled off an ambitious "grand tour" of the solar system's biggest planets, giving scientists some of their first good looks at the Saturn, Jupiter, Uranus and Neptune systems. After wrapping up this work, the Voyagers kept right on flying. Voyager 1 entered interstellar space in August 2012, and Voyager 2, which took a different route through the solar system, should get there soon as well.